The new feedlot ordinance which has been under scrutiny for several months was approved unaminously Aug. 25, by the Stearns County Commissioners. “We put together a plan that everybody can live with,” Henry Dickhaus, county commissioner chairman, said. “It is a good ordinance and by no means is cast in stone. We are trying to make the ordinance convenient for everybody involved,” he added. The feedlot and manure management ordinance has been under intense development since the first of the year, Don Adams, Stearns County Environ-mental Services Director, said. The ordinance is not intended to repeal or impair any existing easements or deed restrictions. However, where this ordinance imposes greater restrictions, the provisions of this ordinance shall prevail. Setbacks were the single biggest concern raised by county farmers, who fear they will be used to squeeze farms out of operation. During public hearings, the setback charts were changed to make them more flexible and accommodating. All setbacks can be reduced by imple-menting either an approved odor reducing technology or an approved manure management plan. 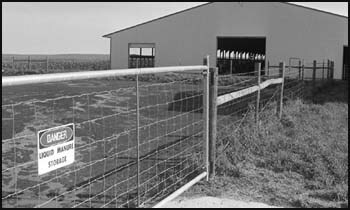 •In the charts for both solid and liquid manure storage, the setbacks from neighboring homes not owned by family members or employees of the feedlot owner were reduced from 2,000 feet to 1,500 feet for feedlots with 500 to 999 animal units and from 2,500 feet to 2,000 feet for feedlots with 1,000 or more animal units. •The setback for spreading manure near neighboring homes when it is incorporated into the ground was reduced from 200 feet to 50 feet. •For those seeking conditional use permits, the number of animal units that require a feedlot to seek expansion approval within one mile of a city or its annexation zone was raised from 250 to 300 animal units, easing that restriction. Sakry said people need to realize the feedlot ordinance is designed to create a balance between maintaining agricul-tural land and urban growth. Adams said it is important that farmers with existing feedlots register within two years as they will be exempt from the setbacks until they expand. “It is to their benefit to register. The farm will be grandfathered in and no matter who owns the farm in the future, it will still be exempt from the setbacks until an expansion is made,” Adams said. “If farmers don’t register, their farm will be treated as a new feedlot and will need to meet the setback requirements established in the new ordinance,” he stressed. A seven-member feedlot panel will be established to review every application to ensure they meet odor management plans and technical review. Panel members will be representatives from Stearns County Environmental Services, Soil and Water Conservation District, Minnesota Extension Service, a county resident (nonfarmer), an ag producer (farmer), ag banking/lending agency, and a township officer recom-mended by the Stearns County Township Officers Association. The 21-page ordinance outlines what will happen with existing animal feedlots with and without a valid state feedlot permit, application requirements, potential pollution hazards, and abandoned wells. Other areas covered include: nonconforming animal feedlots, odor management plan, setback provisions, disposal of animal carcasses, and animal feedlot closure. The ordinance also addresses land area requirements for manure utilization, transportation of manure, manure storage facilities, and manure manage-ment plans. Under the new ordinance, no animal feedlot, manure storage area or manure application site shall be constructed, located or operated so as to create a potential pollution hazard. Evenutally farmers will need to submit a manure utilization plan outlining the number of acres on the farm where the manure will be spread. “This will be a one-time requirement unless modifications are made. At present the permit process is being developed,” a spokesperson said. All vehicles used to transport manure on township, county, state or other public roads shall be leakproof. The owner or operator of an animal feedlot who spills manure on a state or county road shall be responsible for cleaning the roadway as soon as practical after a spill to ensure the safe passage of traffic. Adams said the county board has tried to treat everybody fairly in establishing the new ordinance. The ordinance will be the start of a county-wide permit process for residential development as well. With the adoption of the ordinance, no person shall construct, alter or make addition to a residential dwelling within Stearns County without first securing a construction site permit. Exempt are homes within any city. Applicants must meet all township requirements.